Blistering is a quick, unique cooking technique that can kick flavors up a notch this winter season. With basic ingredients like extra virgin olive oil and a seasoning of choice, blistering can bring out the diverse flavors of simple vegetables.The blistering technique, which as the name implies means creating a wrinkled, blistered skin, is utilized in Seasons 52’s shishito peppers, a popular appetizer on the winter menu. For those wanting to give shishito peppers a try, Seasons 52 also offers them as a small plate on their Sunset at Seasons happy hour menu, available Monday thru Friday from 4:00 to 6:30 p.m. Want to try the menu item at home? 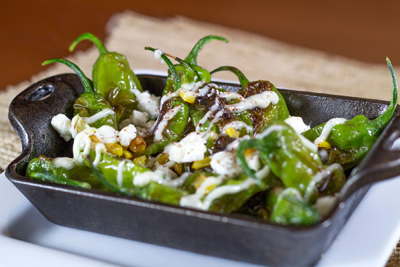 “Because of the simple ingredients required, blistered shishito peppers are the perfect dish to take from our restaurant into your home,” explains Jim Messinger, Executive Chef for Seasons 52. The recipe calls for ingredients home chefs work with frequently, as well as some ingredients that allow for new discovery. In all, three cups of shishito peppers, corn, crumbled feta and goat cheese, Sumac and extra virgin olive oil go into this dish. “The key to shishito peppers is properly blistering the peppers,” adds Messinger. Heat the oven to 350 degrees and add 3 cups of shishito peppers to a pan. After lightly coating the peppers with extra virgin olive oil, add roasted corn (see recipe below) and two pinches of sumac. Place the pan in the oven and let the contents bake for 10 minutes. Once the shishito peppers have reached a wrinkled, softened and darkened appearance, it is time to remove the peppers and place them into your serving dish. Top with crumbled feta and goat cheese, and enjoy. Quick and easy to prepare, shishito peppers make the perfect starter or side dish to wow your guests. Once you’ve mastered the basics of blistering, you can even take the dish a step further by dressing it up with other festive toppings like Seasons 52’s homemade lemon aioli. With countless ways to prepare them, the discovery of new, fresh flavors is endless. Seasons 52 is a fresh grill and wine bar that offers an ever-changing seasonal menu inspired by the appeal of a local farmer’s market and what’s good now. 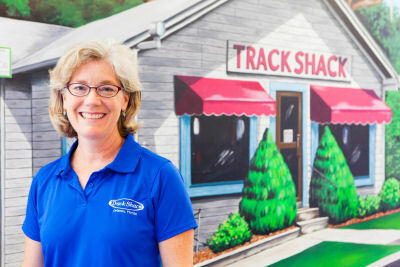 We use ingredients at their peak of freshness, and rustic cooking techniques like brick-oven roasting and an open fire of oak and mesquite to bring out the natural flavors of our food. The menu is paired with a Master-Sommelier curated list of more than 100 international wines, with 52 available by the glass, and handcrafted signature cocktails. Join us for Sunset at Seasons, our happiest hour M-F from 4-6:30 p.m. and enjoy $8 signature cocktails, $6 glasses of select wine and $5 small plates.